The Girls Grammar School is situate on a commanding site on the Mansfield Woodhouse Road and has been erected at the cost of about £5,000, irrespective of the site which was given by Brunt’s Trustees on condition that a certain number of scholars were admitted free. 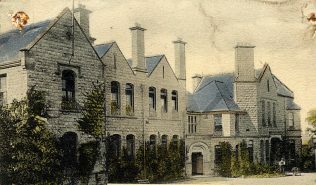 The Duchess of Portland laid the foundation stone in November 1890, and it was opened informally for the first pupils on the 22nd September 1891. The formal opening which took place a month later on the 23rd October, was by Mrs Hollins of Pleasley Vale. The head-mistress at that time was Miss Crossland. This picture was on a post card that was posted on 23rd October 1906 exactly fifteen years after the formal opening of the school.